The best data available is useless if you filter it through the wrong mental model; the cleverest model is stupid with bad data. 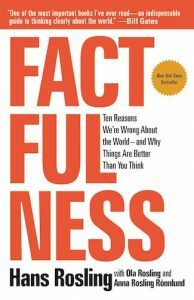 The late Hans Rosling explores this connection by looking at how flawed thinking—bad models—leads to poor judgments despite the availability of quite good data. Rosling’s field is population demographics and public health. He devotes his attention to how and why our intuitions are rooted in dated models. As citizens of an interconnected global economy his arguments matter to all of us. For those of us who worry about how data, analysis, and decisions fit together, Rosling’s insights offer important cautions and guidance. Rosling’s fundamental argument is that the data, interpreted with the appropriate models, tells us that the world is improving along all of the dimensions that matter. He does not offer this as an excuse to stop working on making the world better, nor is he so naive as to claim that problems don’t exist. What he wants us to do is understand what the data is telling us and use that understanding to design and execute actions that will make a difference. Take global population and income, for example. Most of us in the West filter the scraps of data we encounter through an old model of “developed” and “developing” world. There are a few of “us” and a lot of “them.” That split is long gone and Rosling offers a better lens to interpret the data. Instead of an over-simplified—and incorrect—model of rich vs. poor, Rosling offers the following richer breakdown, which groups population into four levels of daily income. What is important about this model is what it tells us about the middle. Level 4 is us; we can afford cars and smart phones and family vacations. Level 1 is the extreme poverty that most of us think of when we invoke the classic “us vs. them” perspective. Levels 2 and 3 represent people who can think about tomorrow and beyond; the car may be used but it runs, the phone is just as smart as yours, and a vacation is in the cards. Rosling offers good advice about how to compensate for our dated models and the thinking habits that cause us to misinterpret the data. He organizes those bad thinking habits into ten instincts ranging from our preference for bad news to our tendency to think in straight lines to our search for someone to blame. For each of those instincts he demonstrates why they feel so go and lead us so far astray. He offers a wealth of mini-cases and stories to teach us how to tease better insights out of the numbers by being smarter about the models we put to use. Factfulness is a master class in data interpretation and storytelling with data. Along the way, you’ll unlearn some bad models you’ve been carrying around and replace them with more accurate and effective ones. It doesn’t hurt that Rosling views the world from a systems perspective, is comfortable with “it’s complicated” as a response, and still demands that we take responsibility for our actions. Rosling passed away in 2017 but his work continues with this book and with his children. When you’re done with the book, plan to spend some more time exploring these ideas at Gapminder.org, where you’ll find more data, some software tools, and more to learn. Fabulous, thanks for this. Did you read Everybody Lies? Late to the game, but interesting data read. Familiar with it, but haven’t read it yet.